In this paper, Lucy Bell explores concepts of locality, resistance and autonomy as they are theorized and practiced within the cardboard publishing movement. Editoriales cartoneras have often defined themselves, and been defined by critics, against transnational publishing corporations, but descriptions of this ‘resistance’ are often vague and sometimes contradictory. This is the first study to focus on the relationship between cartoneras and multinational publishers, examining areas of opposition and overlap. The paper begins by exploring the effects of the rise of transnational corporations on the world of publishing in Latin America, including neo-imperialistic centralization, concentration, and capture by market and political forces. It then turns to two case studies based (principally) in Mexico: La Verdura Cartonera and Pensaré Cartoneras. Close readings combined with interview materials illuminate the principles and practices of cartoneras, from community and collaboration to marginality and autonomy, that challenge those of transnational publishing corporations. Bell’s contention is that, while these tiny publishing projects cannot possibly ‘compete’ with such large corporations, what they can do is open spaces in which – to use the words of Aurelio Meza (Kodama Cartonera) – things can be done differently. Latin American editoriales cartoneras are small, independent publishers that make their books by hand out of recycled cardboard, and sell them at more affordable prices than large publishing houses. The first project that identified itself in this way was Eloísa Cartonera, which came into being in the wake of the 2001 economic crisis in Argentina, during which unemployment rates soared, people found themselves homeless and many took to collecting scrap materials to sell on to recycling companies to make a living. 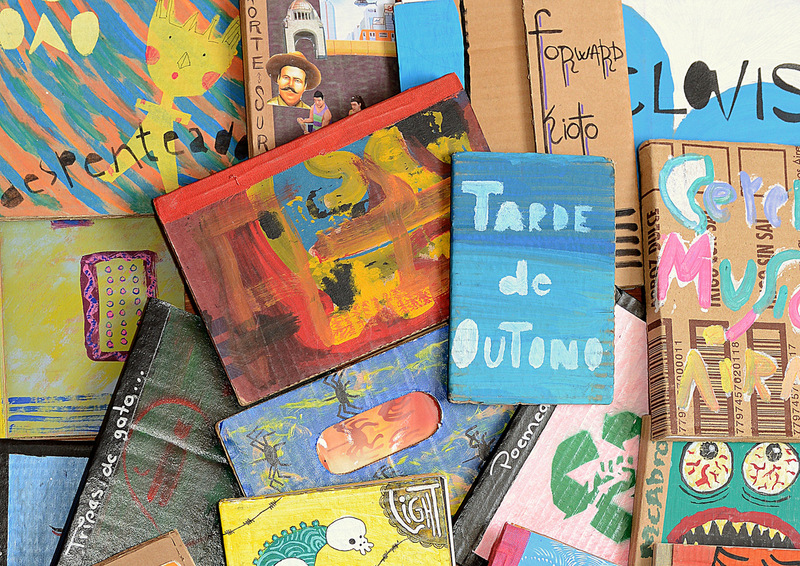 In 2003, Washington Cucurto, Javier Barilaro and Fernanda Laguna began buying cardboard off the porteño waste pickers at five times its market value to produce hand-painted books. Since then, the Eloísa project has gained international acclaim and expanded their collection to over 100 titles by authors from all round Latin America. In turn, it has inspired similar projects across and beyond Latin America, in Chile, Peru, Colombia, Brazil, Mexico, and more, and as far as Sweden, France and Mozambique. una que le saca la lengua con sus portaditas de cartón a las editoriales transnacionales con las que se codea en las mismas vitrinas de las librerías; al ser un alegato a los precios altos imponiendo precios bajos al alzar la voz y oponerse a la lejanía con la cultura, la lectura y el arte; al abrir oportunidades y generar vínculos reales a los que, decimonónicamente, han estado relegados a un espacio mínimo de difusión cultural, escupidos por el oficialismo (Ximena Ramos Wettling 2009, 81). She views the resistance of the cartoneras as a direct confrontation with, and challenge to, transnational publishing corporations. In her admittedly idealistic vision, cardboard publishers compete against large-scale publishers by juxtaposing their books ironically and critically with other, formal publications in bookshops; by undercutting their prices; by bringing books down to earth, therefore fighting against the alienation that many feel towards literature and art; and by opening the scene of reading, writing and publishing to those social groups who are excluded by the ‘official’ cultural scene. However, this optimistic depiction of cartonera publications presents two principal problems. The first is that, in most Latin American countries and cities, cartonera books do not appear on the shelves of mainstream bookshops – let alone in their window displays. Given their informal, artisanal format and (in most cases) their lack of ISBN numbers, most editoriales cartoneras have to seek alternative channels of dissemination, like small cultural centres or cafés, book fairs and presentations, and, in many cases, the internet. The second is that, if cartonera publishers seek to compete directly with transnational publishing firms, they end up falling into the same traps of commercialism, marketization and competition as the corporations they set out to resist. According to Meza, the engulfing of smaller, family-run publishing houses by huge transnational firms and the consequent quasi-monopolization of the industry has had a number of ill effects on the Latin American literary scene: its concentration and loss of diversity; the homogenization of tastes, genres and trends; the exclusion of authors who are more ‘risky’ because they are less well-known or commercial. However, unlike Ramos Wettling, Meza does not see the cartoneras as undermining, undercutting or competing directly with the transnational publishing industry. For him, this would be an impossible task: because they are made by hand, cartonera books do not come in large print runs; nor are they sold in mainstream bookshops due to their informal formats, less commercial content and lack of ISBNs. Instead, they constitute a local ‘pocket of resistance’ by showing that ‘things can be done differently’, using a number of tools like the internet, copyleft and the good will of the publishers. Similarly, Ksenija Bilbija (2009) sees the arrival of cartonera books as an event that ‘irrumpe en el mundo de las editoriales transnacionales’ (11), which she criticizes for their ‘exclusión de todo lo que no esté escrito según la receta ya probada’, for their promotion and production of ‘una escritura rutinaria, caracterizada por la eliminación de los riesgos asociados con la experimentación’ (7). These processes of homogenization and exclusion are inevitable, she suggests, in the context of big businesses guided by marketing and profitability rather than literary, cultural and artistic value. She locates the resistant potential of cardboard publishers in their desire to ‘forjar movimientos de colaboración, comunidades sociales y de sobrepasar las fronteras nacionales, todavía irónicamente mantenidas por las grandes editoriales multinacionales, que tienden a distribuir sus escritores sólo dentro de los ámbitos locales, creando así una ilusión del mercado nacional’ (7). The cartonera movement, for her, is paradoxically more transnational than supposedly ‘transnational publishers’. This study delves further into this question of resistance, examining how the principles and practices of cartoneras contrast, challenge and contest those of large scale publishing corporations. It also addresses areas of tension, where their operations seem to overlap with those of transnational publishing houses. In order to explore these points of opposition and overlap, I will begin by exploring the impact of the rise of globalization and transnational corporations on the world of publishing in Latin America. It is against this backdrop that I shall examine the cardboard publishing movement, by focusing on two case studies – La Verdura Cartonera (Mexico City) and Pensaré Cartoneras (Valencia and San Cristóbal de las Casas) – and using close readings of cartonera texts combined with online materials and interviews. My contention is that the transnational publishing market – as damaging as it might be for local cultural production – has paradoxically fuelled the emergence of independent, craft publishers who, sometimes through the same channels as large multinational corporations, have built their project on principles and practices of local community and international collaboration, marginality and autonomy. While it is undoubtedly true that these tiny organizations and projects cannot possibly ‘compete’ with corporations on such a vast scale, what they can do is open spaces in which things can be done differently. Given how much ink has been spilled on the consequences of recent processes of globalization on Latin American cultural production, surprisingly little has been written on the transnational publishing industry in this area. Burkhard Pohl (2001a) is among the first to tackle this issue in a chapter that examines the relationship between the Spanish publishing market and Latin American literature in the 1990s. As Pohl points out, the transnationalization of Latin American publishing markets is linked to its debt crises in the 1980s. At this point, many publishing houses were forced to close not only in Latin America, but also in Spain (unsurprisingly, since a large proportion of Spanish books were – and still are – destined for export to Latin America). The new commercial strategy was the expansion of publishers into huge, transnational conglomerates like Alfaguara, Tusquets, Planeta and Plaza y Janés, through the absorption of businesses or the creation of subsidiaries, which produced different catalogues corresponding to different countries (Pohl 2001a, 262) – different catalogues that, as Bilbija points out, ironically tend to leave national borders intact. Pohl refers to this phenomenon as a ‘Latin American fashion’ (265), where Latin America is at once the product and the market. In other words, ‘Latin America’ – as it was branded and marketed – was sold not only to Spanish audiences, but also back to Latin America. As a result of these mergers and acquisitions, Pohl argues that a ‘pan-Hispanism’ has emerged. Pan-Hispanism, generally conceived as a political trend aimed at achieving cooperation between, or even unification of, Spain and Spanish-America, is a complex term. Historically, it might be characterized by key moments in the nineteenth and twentieth centuries: in 1833, when the death of Ferdinand VII led to a shift in public opinion towards conciliation and cooperation with the former colonies (Van Aken 1969); in the early 1900s, sparked by the renaming and reclaiming of the 12th October as the Día de la Raza by Faustino Rodríguez-San Pedro (President of the Ibero-American Union) in 1914; and in the subsequent emergence of pan-Hispanic organizations like the Association of Spanish Language Academies (1951) and the Ibero-American Summit (1991). Though it is in principle a movement towards greater cooperation between Hispanic countries, it has often served as a cultural mask for expansionism and neo-colonial hierarchical structures presided by Spain. This is precisely the sense in which Pohl uses the term, illustrating it with the example of Alfaguara (set up in Spain in 1964, and later merged with Grupo Santillana, before the latter was acquired by Spanish conglomerate PRISA in 2000 and then Penguin Random House in 2014). Launched in 1993, the initiative Global Alfaguara had as its objective the publication of works from the ‘whole of the Spanish-speaking world’, marking a decided turn from their previous editorial policy – the publication of translations of prestigious non-Hispanic authors like Gunter Grass and Henry Miller (266). The seizing on the idea of a ‘common language’ is exemplified through Pohl’s interview with the principal editor of Alfaguara, Juan Cruz, in which the latter rather bafflingly argues that Latin American writers are Spanish because they write in Spanish: ‘la gran industria es que escriben en español’ (322). Cruz dismisses Pohl’s point that ‘muchos lectores no les consideran españoles, sino latinoamericanos’: ‘a mí me da igual. Habría que acabar con la idea de que son de un sitio o de otro’ (322). Pohl relates these extreme, deterritorializing notions to a broader ‘liberal pan-Hispanic discourse’, characterized by the affirmation of a common Spanish language and of Spain as the mediator of Latin American interests vis-à-vis the EU and the US (2001a, 275). This transformation of a national space into a site of mediation for a Spanish-speaking ‘community’ produces, in Pohl’s terms, ‘a restricted global identity’ (2001a, 275) and a largely uni-directional Pan-Hispanism. Observing the import-export market of books between Spain and Latin America, Pohl notes that, in 1997, 40% of all books published in Spain were exported to Latin America, while books imported from the region amounted to a mere 2.5%. The equivalent document published in 2013 reveals that little has changed over the last two decades: 47% of Spain’s publishing export profits are made from the Latin American market, while only 3.8% of the total number of imported books in Spain are from Latin America (2013). Neo-imperialistic relations thus emerge in a transnational publishing scene in which cultural production flows almost exclusively in one direction – from Spain to its former colonies – meaning that cultural and artistic value is determined and arbitrated principally by the former colonial power. Juan E. De Castro (2008) has updated Pohl’s analysis in the context of the twenty-first century. Like Pohl, he notes the overwhelming centralization of Latin American literary publishing in Spain: Emecé (Borges’ publisher), he observes, has been bought by Planeta; Losada has moved from Argentina to Madrid; and ironically, Sudamericana was bought by Random House Mondadori (a joint venture by Random House, now owned by German and Italian media conglomerates Bertelsmann and Mondadori), whose headquarters are located in Barcelona (2008, 173). As a consequence of the asymmetric and unrepresentative centralization of the ‘liberal pan-Hispanic discourse’, nominal egalitarianism is combined with a ‘de facto hierarchy in which Spain acts as both mediator between Hispanophone culture and the cultures of the rest of the world as well as the arbiter of what is of value or what is worthy of publication and pan-Hispanic distribution’ (95). Spain, he claims, for the first time since the end of the nineteenth century, ‘has become the true “Intellectual Meridian” of the Hispanophone world’ due to a renewed ‘commercial and economic hegemony’ (95). Pan-Hispanism, therefore, is seen as a cultural mask for this economic logic of expansion. More recently, Craig Epplin, with a specific focus on Argentina, offers a rather different perspective, moving the focus from the dependency of Latin American literature on Spanish publishing, marketing and branding to the relationship between certain key Latin American localities and what he calls ‘global energies’ (2014, 21). He agrees with the above authors about the hegemony of transnational publishing firms, contextualising twenty-first century book culture in terms of Fredric Jameson’s ‘late capitalism’, as characterized by ‘the transnational corporation, the hegemony of finance capital, and the erosion of national boundaries’ (19), as well as a heavy dependence upon digital technologies. However, his argument is that globalized book culture, far from being summarily deterritorialized, is in counterpoint with certain localities. He chooses to focus on Argentina because, ‘despite the dynamics of globalization, which decenter and distribute relationships, nodal points generally emerge in geographical proximity, or they bear the traces of proximity’, and focusing on these localities sheds light on contemporary book production and circulation (20-21). As suggested by Epplin’s use of the Jamesonian concept of ‘late book culture’, the twenty-first century publishing scene in Latin America cannot be understood in isolation from the rise of mass media and communications, and more broadly still, to the furthering of neoliberal agendas by governments across much of the continent. In Manuel Alejandro Guerrero and Mireya Márquez-Ramírez’s terms, ‘Latin America approached the 21st century with a strengthened (neo-)liberal discourse that in theory would strengthen media competition and plurality, as well as more financial and editorial autonomy, but in practice, greatly benefited the largest media corporations’ (2014, 10). Accordingly, they contextualize the development of the media and cultural industries (including book publishing, both print and digital) in terms of what they term the ‘captured liberal model’ (4), a commercial system that has been captured both by economic and political interests – both by the state and the market (5). They point to the emergence of a ‘media class’, or a ‘media establishment that has not necessarily served the interests of media pluralism and democracy’ but rather of ‘the legitimation of political elites and the consolidation of media conglomerates in the region’, conglomerates whose focus is on efficiency and market performance (10-11). According to Guerrero and Márquez-Ramírez, the deregulation of media markets in Latin America has not generated healthier competition or policies that limit concentration, but ‘the lack of open competition, pluralism and a true representation of social groups is a continuing concern’ (12). Regarding the cultural industries, such as Spanish-language publishing, they suggest that the capture results partly from the ‘from challenges posed by ineffective policy that fails to address the role of class and ethnicity in legitimizing a hegemonic national culture’ (14). Though the lack of effective policies are purported to be the cause of this ‘captured liberal model’, they also determine its consequences. The lack of a plurality of actors across different classes and ethnicities of course has a direct effect on production and consumption. In a chapter on Latin American publishing industries in the digital world, Stella Puente points to the fact that current market conditions ‘endanger both the development of a productive sector with a diverse set of participants and the production and circulation of a diverse set of contents’ (2014, 244). To this, we could also add the fact that the concentration of cultural products – of books, in this case – also severely restrict potential audiences, excluding large swathes of the population. La Verdura Cartonera, a small informal publishing project in Mexico City that specialises in short literary works (prose, poetry and theatre), was set up by Lulú Lecona and Ocelotl Galván in 2012. Because of their relative lack of resources, money and time, their aims are modest and their print runs are short (normally 150). Run alongside full-time doctoral study in social anthropology at the Universidad Nacional Autónoma de México (in Ocelotl’s case) and a full-time job in a media agency (in Lulú’s), it is not a profitable business but ‘una editorial sin fines de lucro’ (La Verdura Cartonera 2014). The tensions are apparent in his tentative qualifications (‘not strictly anti-institutional’) and the twists and turns (if not contradictions) of his argument: many of their presentations are promoted by public cultural centres, but they have never considered ‘receiving’ external funding; they see their independence from state financing as essential to their economic, creative and ideological independence, but inevitably collaborate with cultural institutions. They are therefore simultaneously anti-institutional and institutionally-funded, ‘independent’ and highly reliant on different forms of government-support, whether to earn a living through teaching or research (which in turn permits them to run their projects) or to promote their publishing initiatives through cultural institutions. However, in spite of the impossibility of complete independence acknowledged by Meza, the ‘capture’ (be it state or corporate) is challenged to a certain extent through the channelling of dissent into alternative practices. The key to Meza’s argument is the fact that they do not have to be directly accountable to institutions for their publishing activities and outputs – which is also the case of La Verdura. Another seeming contradiction – and possible area of overlap with the transnational publishing industry against which cartonera publishers position themselves – is that the cartonera movement is inherently transnational. La Verdura is no exception. 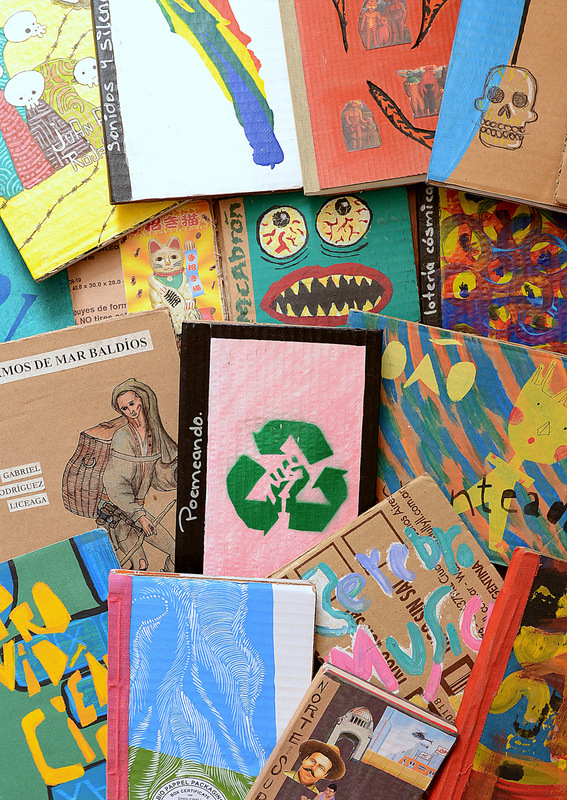 The idea of making books out of recycled cardboard came to Lulú directly from Buenos Aires. In 2008, she met some publishers from Eloísa: ‘no me contaron nada más sobre los libros cartoneros, pero me dieron un ejemplar en las manos y dije wow! Es que esto es único, muy, esto es muy distinto’ (Lecona, Galván & Researcher 2013). Later that year, at the Zócalo Book Fair (one of the main annual book fairs in Mexico City), she found that there was already a cartonera in Mexico: La Cartonera Cuernavaca. This revelation impelled Lulú and Ocelotl to start up their own cartonera project in 2009, under the name La Verdura – a gesture, perhaps, toward Eloísa, which first began selling cardboard books alongside vegetables (Eloísa Cartonera 2015). Since then, La Verdura’s books have circulated outside Mexico thanks to the ever-expanding network of cartoneras, some of whom have travelled and migrated across national borders. Over the last six years, their books have circulated to Spain (through a connection with Meninas Cartonera, which has bases – people – in Madrid and Zacatecas, Mexico), Argentina (through collaborations and co-editions), Chile, Ecuador and even Mozambique (thanks to Meninas publishers, whose member from Zacatecas took some of their books to a craft-publishing workshop there). Without leaving Mexico, La Verdura has been able to connect with cartoneras from all round Latin America through Facebook: at the time of writing this paper, they are ‘friends’ with about forty cartoneras from Mexico, El Salvador, Venezuela, Peru, Argentina, Chile, and so on. More than international flights, it is the digital network of social media that has enabled the growth and circulation of cartonera projects and collections. In spite of the importance accorded to manual production – undoubtedly a defining and integral feature of the cardboard publishing movement – Lulú concedes that ‘Facebook nos ha sido de gran ayuda para poder establecer todas las comunicaciones que vemos hoy en día’, whether to publicize their work, organize workshops, book presentations and literary festivals, or connect with other cartoneras (Lecona, Galván & Researcher 2013). This playfulness is not only enacted in their name, but also in the texts that they publish, like CartonEROS and Norte/Sur, which are filled with wordplay, polyvalence and semantic ambiguity. Yet the wordplay itself seems to be secondary to a sense of collective identity, a rootedness in the popular culture of Mexico City, as shown by their insistent repetition of the words ‘Mexico City’, ‘chilango’ and ‘here’ in their manifesto. Her thesis regarding net art is that ‘new forms of negotiation between the local and the global and between the virtual and the real are constantly being elaborated’, which in turn generates ‘new ways of forming and understanding local, regional, and transnational locatedness’ (6). Though the cartonera movement might be viewed as the polar opposite of net art, due to its insistence on manual production, workshop spaces, face-to-face interactions, it in fact unleashes the same kinds of negotiation. Not unlike net artists Brian Mackern, Martha Patricia, Coco Fusco and Ricardo Dominguez and Ricardo Miranda Zúniga, who integrate the local and the real into the global and virtual (plat)forms in and with which they work, cardboard publishers work in a liminal space between transnational, Facebook networks and local communities, between cardboard materials and virtual platforms, between workshop spaces and Twitter feeds. My contention is that it is precisely this interplay between the local and the global that allows editoriales cartoneras to ‘do things differently’ to transnational publishing corporations. Whereas the global reach of large-scale media corporations relies on competition and results in concentration (Compaine & Gomery 2000) that of cardboard publishers is fostered through collaboration and produces diversity. As Arjun Appadurai suggests in relation to NGOs – and Eloísa has been pertinently described as a ‘fake NGO’ (Palmeiro 2011, 336) – ‘their greatest comparative advantage with respect to corporations’ is that ‘they do not need to compete with each other’ (2000, 17). Collaboration not only allows cartoneras to expand their own projects through wider networks and channels of circulation, but also to highlight their uniqueness and particularities – which in turn promotes and produces diversity. Lulú and Ocelotl work collaboratively whenever they can, in order to bring ‘foreign’ texts into Mexico and to disseminate their own texts outside Mexico. For example, they have set up an exchange with La Sofía Cartonera (Córdoba, Argentina), whereby they have agreed publish one another’s work (Lecona, Galván & Researcher 2013). This idea of collaboration across borders might appear to jar with the claims to the local made – paradoxically, perhaps – in their Facebook manifesto. Yet their play on, with and between cardboard books and Facebook posts, Mexico City’s particularities and international networks, workshop spaces and cyberspace produces what Dodge and Kitchin regard as new links between place, identity and community (2000: 17). For editoriales cartoneras, belonging to a community at once signifies representing existing, local networks and creating new links that – at least temporarily – transgress cultural, social and geographical barriers. The desire to forge communities across geographical barriers was also one of the motivations for the publication of Norte/Sur, a collection of poems, short prose and plays about the different ‘borders’ within Mexico – in the South, the Centre and the North – coedited by Cohuiná (San Cristóbal, Chiapas), La Verdura, and Kodama (Tijuana). Yet, perhaps to distinguish themselves from corporate publishers, for which collaborations result in mergers and concentration, their collective project (re)produces diversity, as the publishers stamp their editions with their own distinctive markers. La Verdura’s edition, like all their texts, is in A6 format, and each of the 150 front covers is different. The covers, mainly made by Ocelotl himself, are most often collages from recycled magazines. Kodama’s edition, on the other hand, is in their habitual A5 format, and its covers are all (more or less) the same. In this case, a stencil and red aerosol paint were used to produce a clever design of the approximate shape of Mexico joined with its inversion. It also has an online version. Cohuiná’s version is not only different in format and design (with painted covers), but also in content: ‘since they received a lot of texts, because lots of people were interested in taking part, they made an extended version’ (Lecona, Galván & Researcher 2013). Furthermore, in another playful gesture, the publishers number their pages differently, underlining the publishers’ desire to mark their differences whilst collaborating on a shared project. Rather than homogenizing cultural production, then, working on a shared project enables cartoneras to attend to local specificities that are reproduced within the plural contents, forms and formats of the books. Unlike the transnational publishing industry, which mediates Latin American texts through ‘central’ locations and mainstream formats (Pohl 2001a; Castro 2008), Pensaré insist on publishing ‘marginal’ texts in ‘marginal’ formats. A somewhat utopian rhetoric is mobilised here to suggest that the cardboard-covered text is not just a cultural response to mass-produced books, but a social project, an attempt to propose ways in which ‘things can be done differently’. Pensaré present themselves less as a publishing model than as a ‘principle of existence’, that is, a project whose modus operandi embodies alternative ways of being and living together. In this final section, we will explore how this utopian discourse coheres with the realities of their practices, and argue that the value of Pensaré Cartonera, like that of Eloísa Cartonera according to Epplin, lies in its ability to imagine ‘alternative social assemblages in the present’, to model ‘a certain kind of social potential’ (396). A key concept advanced in this manifesto is that of ‘marginality’, a term normally used to describe groups of people excluded from, or neglected by, mainstream society for social, economic, political or legal reasons, who may lack access to key resources (Anderson & Larsen 1998; Sommers et al 1999). Mehretu et al define it as ‘a complex condition of disadvantage which individuals and communities experience as a result of vulnerabilities that may arise from unfavourable environmental, cultural, social, political and economic factors’ (2000, 90). As such, it is often (though not exclusively) linked to economic precariousness and poverty. It remains to be seen, then how this university-educated group with ostensibly middle-class professions supports and sustains this identification with the ‘marginal’. On the one hand, it can at least partly be seen as a sign of adherence to the ‘tradition’ of cartonera publishing. Eloísa Cartonera, the first publisher that identifies itself as cartonera, has as its motto ‘nueva narrativa y poesía Sudaca Border’. As Palmeiro suggests, the use of the word ‘border’ places the focus on ‘un canon marginal, una literatura menor (narrativa y poesía) al borde de la tradición y de la identidad’ (2013, 204). She situates the Eloísa model in relation to a ‘trash canon’ that has become institutionalised through universities (particularly left-leaning North American ones) that collect and teach the work (332–35). Palmeiro is highly attuned to the contradictions of a so-called ‘marginal literature’ that has been turned by Cucurto, through Eloísa, into ‘una “empresa” anticapitalista (y transnacional)’ (207). It could be argued that the ‘branding’ of Eloísa as a ‘marginal’ cultural project is precisely what turns it into a transnational phenomenon and an appealing model that has been readopted and reimagined all over and beyond Latin America. This is not to say, however, that Pensaré simply mimics the (sometimes self-contradictory) models and mechanisms of Eloísa. On the contrary, it has its own, quite unique manifesto, a very different catalogue, and a distinct way of framing its so-called ‘marginality’. One of the specificities of Pensaré as a cardboard publisher is that is catalogue – unlike the overtly literary collections of Eloísa and the majority of other cartoneras – consists of political texts. These might be regarded as ‘textos de márgenes’ in different ways. Some, like Insurrección de los muertos // Resurrección de los vivos (Subcomandante Marcos 2014) and Devenir Casta. Otras políticas ante nuevos gobiernos (Zibechi et al, 2015) are written by political activists, militants or collectives representing marginalised communities, according to definitions by the likes of Anderson and Larsen, Sommers and Mehretu (above). Devenir Casta, according to their WordPress catalogue, carries ‘la intención de contribuir a descentrar y descolonizar el debate de lo que se puede y lo que podemos hacer’ and consists of ‘textos colectivos, diversos, múltiples de luchas que conviven en América Latina con gobiernos progresistas y construyen desde la autonomía’ (Pensaré Cartoneras 2015). The ‘marginality’ of these texts is thus strongly associated with the project of decentralisation and autonomy. Indeed, it is a critical distance from the state that makes their work ‘marginal’. Like La Verdura, because their publishing projects are never directly state-funded, they are able to engage in controversial issues that are strongly and overtly critical of Latin American and Spanish governments, as in the collective, anonymous work on the Ayotzinapa disappearances (Anon 2014) and in the book on the desahucios in Spain (Expósito et al 2013). Other texts and corresponding authors in their collection have much less straightforward links with ‘marginal’ communities. Común (sin ismo), for example, is a collection of essays on alternative ways of building community and commonality, by Catalan philosopher and academic Marina Garcés. Yet this text, originally published in 2013 in Catalan and Spanish in the online cultural review Nativa is given a ‘formatos de márgenes’ by Pensaré through a series of frames: most notably, the hand-painted cardboard cover, which has the function of differentiating it from mainstream, mass-produced books by pointing to its imperfections and the manual processes through which it was made; and the prologue by the publishers, which they wrote while participating in a Zapatista event in the Caracol de la Realidad (one of the five seats of government into which the Zapatista autonomous community has been organized), thus physically placing the text in the context of a movement associated with the empowerment of marginalised, indigenous communities. This links back to their notion of ‘textos […] abiertos, manipulables’: the political texts written in a Catalan context acquire new meaning and significance when re-framed by Pensaré Cartoneras in relation to the cartonera and Zapatista movements (a relation to which we return below). Another crucial concept foregrounded in the manifesto is that of ‘local cover, global text’. Marc and Rosa are clearly aware of the contradictions and tensions implied by this idea – notably, their simultaneous insistence on manual (local) forms of production and digital (global) platforms of circulation. When asked whether a publisher that makes its books out of recycled materials has a place in a digital world, Marc retorts that ‘el mundo no es digital, del todo, el espacio que ocupa la cartonera [el internet] no está pensado sólo para los mundos ricos, sino también para los otros mundos que caben en este [mundo] globalizado’ (Ruiz 2014). In this view, the use of cyberspace as a platform for the dissemination of, and collaboration on, cartonera books is not a contradiction but an act of empowerment. The merging of print and digital media (old and new media) has long been theorised through the concept of ‘convergence’. One of the first scholars to introduce this concept in the 1980s was Pool, who discusses the ‘convergence of modes’, defined as the ‘blurring [of] lines between media, even between point-to-point communications, such as the post, telephone and telegraph, and mass communications, such as the press, radio, and television’ (1983: 23). For Pool, this convergence was a potentially emancipatory force: whereas ‘central control is more likely when the means of communication are concentrated, monopolized, and scarce’, ‘freedom is fostered when the means of communication are dispersed, decentralized, and easily available’ (1983: 5). Henry Jenkins, expanding on Pool’s arguments in a twenty-first century context, defines convergence culture as ‘the flow of content across multiple media platforms’, ‘the cooperation between multiple media industries, and the migratory behaviour of media audiences’ (2008: 2). He uses the example of the ‘Bert is Evil’ phenomenon (1–3), in which images from the children’s show Sesame Street, transformed through Photoshop by a high school student into a collage of Bert and Bin Laden, went viral on the internet. It was then printed onto posters across the Middle East to spread anti-Western propaganda, and, in a final twist, re-appropriated by other internet users to depict various Sesame Street characters as terrorists (for the purposes of entertainment and comedy). This journey of transformation is used by Jenkins to illustrate the way in which new and old media are used in tandem, which in turn creates (sometimes infelicitous) exchanges between individuals and corporations, grassroots actors and global producers. Crucial to his argument is the point that convergence culture does not simply entail technological advances, but, moreover, a cultural shift wherein ‘consumers are encouraged to seek out information and make connections among dispersed media content’ (3). Hence he links the phenomenon of convergence to that of participatory culture and multiple forms of DIY culture. When viewed in the context of Pensaré Cartoneras, convergence is not only technological, entailing the combination of manual modes of production and online publishing platforms, of face-to-face interactions at local book fairs or anarchist gatherings and Facebook exchanges across the world. It is also, more importantly, social and cultural. As Epplin writes of Eloísa, ‘it produces, albeit temporarily, social assemblages that cross (without erasing) the barriers erected and maintained around differences in economic and cultural capital’ (2007: 387). With a focus on recycled materials and texts, Pensaré’s project, rather than an attempt to produce new, ‘original’ ideas, is an apuesta (to use their own word) to bring about alternative spaces for dialogue, and socio-political relations between people, ideas and movements – all of which have the potential to produce social transformation, albeit on a very small scale. One of the benefits of combining technology and craft, then, is to engage more people in the project. Though WordPress is an effective publishing platform and Facebook is a mass networking site, ‘the word is not entirely digital’ (Ruiz 2015, my emphasis) and whereas over half of the Global South does not have access to the internet (Zechmeister, Saunders and Brunelle, 2015), anyone can make a book out of cardboard. Pensaré’s initiative is not one that sets out to compete with transnational publishers. On the contrary, it is a small-scale gesture – one that is still in the process of germinating and developing – towards modelling different forms of participation and cooperation, not only through their ways of working and producing, but also the content of the texts and paratexts: in Común (sin ismo) (Garcés 2014), as aforementioned, the philosophical ideas of a Catalan philosopher are reimagined in the political context of the Zapatista movement; more overtly, in Devenir Casta (2015), Pensaré Cartoneras bring together texts by Raquel Gutiérrez, EZLN spokespeople, Raúl Zibechi, Colectivo Situaciones, Sandro Mezzadra, Verónica Gago, Emiliano Teran, Colectiva feministas autónomas, María Galindo, Álvaro Garcia Linera, Rafael Uzcátegui and Rosa Lugano to suggest connections or spark relations between different struggles, actions and activists across Latin America, from Argentina to Mexico. The ways in which Pensaré edit, produce, format and circulate their work thus gestures towards new, potentially fruitful relations across class- and ethnic barriers that play a significant role in the media and publishing industries in legitimizing hegemonic cultures (Guerrero and Márquez-Ramírez 2014). Further tension might be seen to arise in the discourse mobilised here. The identification of the publishers with ‘los de abajo’ – which in the Mexican context is difficult to separate from the revolutionary discourse of the early twentieth century and the literary tradition of the ‘novela de la revolución’ in the line of Mariano Azuela – is clearly a demonstration of solidarity for the working classes. Yet the Pensaré publishers are university-educated, have lived in both Latin America and Spain, and have worked in the education and arts sectors. As suggested in the language they use, there is a gap between their working class, quasi-revolutionary rhetoric and some of their much more middle-class practices. This is in fact acknowledged by the publishers themselves. The words ‘decimos estar’ points towards some of tensions they face – alongside most other cartonera organisations – between discourse and practices, social movements and political/economic structures, ideals and realities. Another point of contention is the idea of reappropriating the concept of ‘autonomy’ through a ‘shared common language’. While this might fit with some of their publications, like Subcomandante Marcos’s Insurrección, it is harder to square with others like Tiqqun’s De la economía como magia negra which quotes extensively from Marx, Hegel, Mauss, Malinowski, Baudrillard and so forth. Finally, the very notion of ‘autonomy’ might be seen to jar somewhat with the fact that they have (albeit indirectly) made use of state funds to make a living and pursue their publishing activities. Hence the importance of their alignment with ‘los movimientos críticos de los social’, with movements that constantly call into question the social status quo and the established order, most notably with the Zapatista movement that has had a huge influence on their discourse and thought – an alignment that reflects that of other cartonera publishers, like Meza as suggested by his quotation of Subcomandante Marcos’s notion of a ‘local pocket of resistence’ (cited above). In fact, this section of the manifesto was added in their later publications, after they spent time with the Zapatistas in Chiapas. Their conception of autonomy, therefore, cannot be separated from that of the EZLN. This, however, does not necessarily help to clarify their position, but rather sends us into equally ambiguous and multivalent territories. On a basic level, the Zapatista movement is a fight for decentralization, as represented by the RAP (Regiones Autónomas Pluriétnicas) that were already being constructed in certain parts of Lacandon Jungle prior to the 1994 uprising (Stahler-Sholk 2007, 50). This in turn constitutes the main basis for their notion of autonomy as a ‘struggle for community control against the atomizing force of the market’ (52). Yet the Zapatistas’ politics and philosophy of autonomy is much more complex than that: their insistence on building autonomy from the community upwards has left the movement ‘open to a kind of pluralism of autonomies – “a world in which many worlds can fit” – [rather than forcing] a choice between autonomy models’ (50). In order to gain a better understanding of the ways in which the Pensaré initiative has been influenced by Zapatista actions and rhetoric, let us turn to one of their own books on the subject. [Kurdistan y Chiapas] son lugares del mundo que han sido paulatinamente alejados de los medios de comunicación a los que nos entregamos por comodidad. Este estado de cosas, “entre la luz de los focos y la sombra del olvido”, les ha permitido recomenzar tras desaparecer guardando las armas: estar construyendo autonomía, un mundo volcado sobre un nosotras concreto y propio […] Como Pensaré queremos seguir tejiendo con nuestra labor editorial resistencias sin mediar con las empresas de comunicación, construir mundos con nuestras manos y en nuestras palabras, lenguas y oídos (Pensaré, in Biehl et al 2015, 10–11). The aim of cartoneras is not to intervene or compete with multinational communication conglomerates, but rather to create alternative spaces in which different ways of being and working together can be proposed and tested out. The focus here is on the artisanal, embodied and collective nature of this gradual creative process, on ‘weaving’ resistances with their hands, tongues and ears. This chimes with Bachet’s notion that Zapatista teachers are ‘artesanos “ordinarios” de la construcción de la autonomía’ (41). Though it is difficult, because of the vastly different scales, groups and aims, to compare the socio-political movement of Zapatismo and the socio-cultural movement of cardboard publishing, what is emphasised in both is the importance of constructing anti-hegemonic meanings and worlds from concrete, immediate realities; of proposing ways of working that propose alternatives to the ‘captured liberal model’ (Guerrero & Márquez-Ramírez 2014). This chimes with the work of Ana Dinerstein and others, who, in relation to recent social movements in Latin America, argue that autonomy is a process that is at once gradual, never-ending and, consequently, idealistic (hence their term ‘hope movement’) and eminently concrete and practical: ‘la autonomía colectiva es un proceso de permanente construcción’, ‘un proceso abierto’ and ‘un sitio de la lucha (Dinerstein et al 2013, 27–8); social movements root themselves in tangible, pre-existing realities and present ‘alternativas en que la experiencia concreta se convierte en el instrumento de oposición y crítica’ (33). Similarly – and unlike the transnational media establishment, which is governed by a ‘media class’ and captured simultaneously by hegemonic economic and political elites – editoriales cartoneras are grassroots organizations that respond to immediate, local concerns and seek to provide spaces for marginalized voices to be heard, ideas to be aired, or positions to be held. In the attempt to resist against pan-Hispanic discourses in which local specificities are submerged and diffused by a global Spanish-language market, Pensaré root themselves firmly, reflexively and actively in local contexts – while also, like La Verdura, bringing into dialogue voices from different countries and contexts. In this paper, I have sought to delve into the relationship(s) between editoriales cartoneras and the transnational publishing industry by examining their respective principles, processes and products. As suggested by the case studies above, cartoneras do not engage in a direct struggle against large multinational corporations, but rather create spaces in which alternative approaches, methods, voices and narratives can travel – not from the ‘centre’, but rather from the peripheries. In that sense, theirs is at once a resistance against dominant models of publishing and – more importantly – a proposition, or rather a series of propositions, regarding how things can be done differently in, and beyond, the world of publishing. Though the movement poses no direct threat to ‘captured liberal’ publishing models, it constitutes itself as a medium for diverse voices that are perhaps united only by their attempt to put into question, as Mentinis phrases it, ‘what there is’ (1996, 144). Many tensions, it must be acknowledged, are left unresolved by the current study. One of these is the problem that Meza addresses regarding the danger of the fetishization and idealization of the cartonera movement in North American academia and institutions, particularly through the edited volume Akademia Cartonera and the collection in Wisconsin-Maddison’s university library (Meza 2014). Implicit here is the question of whether the cartonera book has become yet another brand, another way of selling Latin America; whether these supposedly alternative publishers are being subsumed by the same logics of marketing and marketization as multinational corporations (exemplified above by Pohl’s point about the ‘Latin American fashion’ promoted or dictated by Alfaguara Global). Naomi Klein, in No Logo, argues that the unifying idea of corporate globalization is that corporations should produce brands rather than products, producing a ‘frantic corporate quest to get out of the product business and into the ideas business’ (2009, xviiii). If the idea of making a book by hand out of found materials is divorced from the meaning of this publishing model, if the cardboard shell or packaging is valued over the substance of the books, the cartonera movement certainly runs the risk of becoming a ‘hollow’ project, as Klein would put it. However, cartonera publishers, as this article has sought to demonstrate, resist the severance of the idea from its meaning, not by sticking fixedly to the original meaning of cardboard publishing as defined by Eloísa Cartonera, but rather by transforming that meaning, by reinvigorating it in their local contexts and specific situations through their own manifestoes, productions and collaborations. Ultimately, it falls upon cartonera readers and critics to resist the reduction of the cartonera book to a fetishized, artisanal object by engaging not only with the form and format of the books (which is admittedly, especially in cases like Norte/Sur, very important), but also to their content and substance. This point is raised by Ben Bollig, who, in the context of a review of recent works on contemporary Argentine poetry, calls ‘for detailed analytical attention to [the cultural] object, rather than using it as a jumping off point for theoretical considerations independent of or uprooted from a context of cultural production’ (2015). What this entails in relation to cartoneras is that, in order to gain a deeper understanding of this complex socio-cultural movement, further multidisciplinary research needs to be undertaken, combining close readings of the texts (whether literary or political) with anthropological studies of the relations and networks that surround them, locally and/or globally. Anon. 2014. Ayotzinapa. Desaparición Política. Mexico: Pensaré Cartoneras. Anderson, John and Jorgen Elm Larsen. 1998. ‘Gender, Poverty and Empowerment’, Critical Social Policy, 18(2): 241-258. Appadurai, Arjun. 2000. ‘Grassroots Globalization and the Research Imagination’, Public Culture 12 (1): 1–19. Bell, Lucy. 2016 (forthcoming). ‘Recycling Materials, Recycling Lives: Cardboard Publishers in Latin America.’ In Adeline Johns-Putra, John Parham and Louise Squire (eds), Literature and Sustainability. Manchester: Manchester University Press. Biehl, Janet, Jérôme Baschet, Carlos Lenkersdorf, and Petar Stanchev. 2015. Aprender Escuchando. Autonomía, Educación, Guerrilla en Chiapas y Kurdistán. Can Tonal: Pensaré Cartoneras. Bollig, Ben. 2015 (forthcoming). ‘El libro era una cosa que ocupaba espacio (Néstor Perlongher). Recent Works on Poetry, Publishing and Performance in the Contemporary Southern Cone’, Journal of Latin American Cultural Studies, 24.3. Bilbija, Ksenija. 2009. ‘¡Cartoneros de todos los países, uníos! : Un recorrido no tan fantasmal de las editoriales cartoneras latinoamericanas en el tercer milenio.’ In Akademia Cartonera: Un ABC de las editoriales cartoneras en América Latina, edited by Ksenija Bilbija and Paloma Celis Carbajal, 5–30. Madison: Parallel Press. Brown, Michael. 1992. ‘The possibility of local autonomy’, Urban Geography 13, 257–79. Carballo, Alfonso, Ocelotl Galván et al. 2012. Norte/Sur (Versión Centro). Mexico City: La Verdura Cartonera. Compaine, Benjamin M., and Douglas Gomery. 2000. Who Owns the Media? Competition and Concentration in the Mass Media Industry. Mahwah, New Jersey; London: Lawrence Erlbaum Associates. De Castro, Juan E. 2008. The Spaces of Latin American Literature: Tradition, Globalization, and Cultural Production. New York: Palgrave Macmillan. Dinerstein, Ana, Melina Deledicque, Juan Pablo Ferrero, Rodrigo Pascual, and Daniel Contartese. 2013. Movimientos Sociales y Autonomía Colectiva: La política de la Esperanza en América Latina. Buenos Aires: Claves del Siglo XXI, Capital Intelectual. Epplin, Craig. 2014. Late Book Culture in Argentina. New York: Bloomsbury. Expósito, Marcelo y el Blog colectivo Al final de la Asamblea. 2013. Multitud – Desahucio. Crónicas de resistencia frente a la barbarie de la vivienda en el estado español. Salt, Girona: Pensaré Cartoneras. Garcés, Marina. 2014. Común (sin ismo). La Realidad (Zona de Selva Fronteriza): Pensaré Cartoneras. Guerrero, Manuel Alejandro, and Mireya Márquez-Ramírez (eds). 2014. Media Systems and Communication Policies in Latin America. Basingstoke: Palgrave. Klein, Naomi. 2009 . No Logo. New York: Picador. Lecona, Lulú, Ocelotl Galván, and Researcher. 2013. Interview with La Verdura Cartonera. Mexico City, 13th September. Mehretu, Assefa, Pigozzi, Bruce Wm. and Sommers, Lawrence M., 2000. ‘Concepts in social and spatial marginality’, Geografiska Annaler, 82 B (2), 89–101. La Verdura Cartonera. 2013. ‘About.’ Accessed September 4 2015. https://www.facebook.com/LaVerduraCartonera. Pensaré Cartoneras. 2015. ‘Catálogo’. Accessed January 26 2016. Pickerill and Chatterton. 2006. ‘Notes towards autonomous geographies: creation, resistance and self-management as survival tactics’, Progress in Human Geography 30(6), 1–17. Pohl, Burkhard. 2001a. ‘¿Un nuevo boom? Editoriales españoles y literatura latinoamericana en los años 90.’ In José Manuel López de Abiada, Hans-Jörg Neuschäfer, Augusta López Bernasocchi (eds), Entre el ocio y el negocio: Industria editorial y literatura en la España de los 90, 261–92. Madrid: Verbum. ————. 2001b. ‘La vocación de editar en español. Entrevista con Juan Cruz (18-II-1999).’ In José Manuel López de Abiada, Hans-Jörg Neuschäfer, Augusta López Bernasocchi (eds), Entre el ocio y el negocio, 319–26. Pool, Ithiel de Sola. 1983. Technologies of Freedom. Cambridge (Mass) & London: Harvard University Press. Puente, Stella. 2014. ‘The Publishing Industries in Ibero-America: Challenges and Diversity in a Digital World’. In Guerrero, Manuel Alejandro, and Mireya Márquez-Ramírez (eds), Media Systems and Communication Policies in Latin America, 243–53. Basingstoke: Palgrave. Ramos Wettling, Ximena. 2009. ‘Animita Cartonera – Resistencia.’ In Akademia Cartonera: Un ABC de las editoriales cartoneras en América Latina, edited by Ksenija Bilbija and Paloma Celis Carbajal, 81–83. Madison: Parallel Press. Sommers, Lawrence, Mehretu, A. and Pigozzi, Bruce W.M. 1999. ‘Towards typologies of socio-economic marginality: North/South Comparisons’, in Jussila, H., Majoral, R. and Mutambirwa, C. C. (eds. ), Marginality in Space – Past, Present and Future: Theoretical and methodological aspects of cultural, social and economical parameters of marginal and critical regions, 7–24. England: Ashgate. Stahler-Sholk. Richard. 2007. ‘Resisting Neoliberal Homogenization: The Zapatista Autonomy Movement’, Latin American Perspectives 34(2), 48–63. Subcomandante Marcos. 2014. Insurrección de los muertos // Resurrección de los vivos. Rebobinar I, II y III (1994-2014). San Cristóbal de Las Casas: Pensaré Cartoneras. Taylor, Claire. 2014. Place and Politics in Latin American Digital Culture: Location and Latin American Net Art. New York: Routledge. Taylor, Claire and Thea Pitman. 2007. Latin American Cyberculture and Cyberliterature. Liverpool: Liverpool University Press. Tiquun. 2014. De la economía como magia negra. Una crítica metafísica. Viña del Mar: Pensaré Cartoneras. Zibechi, Raúl and multiple authors. 2015. Devenir Casta. Otras políticas ante nuevos gobiernos. Valencia: Pensaré Cartoneras. Key names in this area are George Yúdice, Néstor García Canclini, Carlos Monsiváis and Jesús Martín Barbero, to name but a few. Postdating Castro’s publication, however, Sudamericana has become an imprint of Penguin Random House, since 1st July 2013, when the British publisher Penguin merged with Random House, producing the world’s largest publishing conglomerate, with Orwell’s 1984 sharing its label with Fifty Shades of Grey (Doncel 2013). It should be noted that Lulú is in fact not from Mexico City, but from Tijuana, though she has come to identify herself as a chilanga. As Claire Taylor (2014) points out, these include the notion of the internet as a ‘global village’ that became commonplace in the 1980s and 90s; the concept of the ‘netizen’, a ‘citizen of the world thanks to the global connectivity that the Net makes possible’ (Hauben and Hauben 1993: 3); and Perry Barlow’s ‘Declaration of the Independence of Cyberspace’ that depicts the internet as a ‘global social space’ detached from geographical fixities (1996). Further essays on the role of place in Latin American cyber cultural production can be found in Taylor and Pitman (2007). The question of whether or not the Zapatistas actually succeed in constantly challenging the social status quo is beyond the scope of this article, but is very helpfully and critically dealt with in Mentinis (2006, Chapter 5). Dinerstein et al examine, among other examples, ‘las Juntas Vecinales bolivianas y el zapatismo [que] hunden sus raí-ces en el comunitarismo indígena, que les aporta un anclaje ancestral y una memoria activa de prácticas colectivas bien vigentes, para proyectar al futuro y como alternativa concreta al capitalismo’ (2013, 11).